Definition at line 57 of file llmanipscale.h. Definition at line 181 of file llmanipscale.cpp. References f, i, mManipulatorScales, mProjectedManipulators, NUM_MANIPULATORS, S32, and sort_manip_by_z(). Definition at line 205 of file llmanipscale.cpp. Definition at line 2044 of file llmanipscale.cpp. References f, func, and LLManip::mObjectSelection. Referenced by handleMouseDownOnPart(), highlightManipulators(), and render(). Definition at line 129 of file llmanipscale.cpp. References f, glColor4fv, i, LLManip::LL_NO_PART, MANIPULATOR_IDS, mBoxHandleSize, LLManip::mHighlightedPart, mManipPart, mManipulatorScales, mScaledBoxHandleSize, LLColor4::mV, NUM_MANIPULATORS, and S32. Referenced by renderCorners(), renderEdges(), and renderFaces(). Definition at line 1895 of file llmanipscale.cpp. 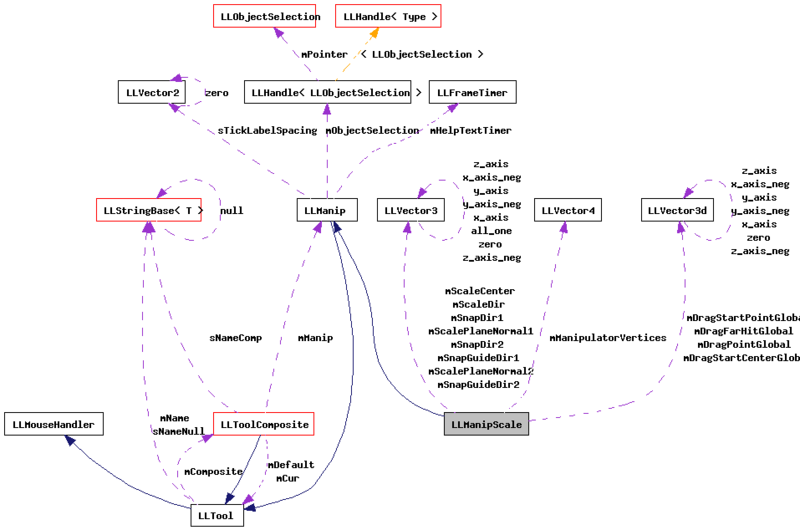 References LLVector3::clearVec(), F_SQRT3, LLManip::LL_CORNER_MAX, LLManip::LL_CORNER_MIN, LLManip::LL_CORNER_NNN, LLManip::LL_CORNER_NNP, LLManip::LL_CORNER_NPN, LLManip::LL_CORNER_NPP, LLManip::LL_CORNER_PNN, LLManip::LL_CORNER_PNP, LLManip::LL_CORNER_PPN, LLManip::LL_CORNER_PPP, llassert, and LLVector3::setVec(). Definition at line 809 of file llmanipscale.cpp. References LLAgent::clearFocusObject(), dragCorner(), dragFace(), gAgent, LLXform::getPosition(), LLXform::getScale(), LLSelectMgr::getSelection(), gSelectMgr, LLPrimitive::isAvatar(), LLManip::LL_CORNER_MAX, LLManip::LL_CORNER_MIN, LLManip::LL_FACE_MAX, LLManip::LL_FACE_MIN, mManipPart, LLViewerObject::permModify(), LLViewerObject::permMove(), S32, and LLSelectMgr::updateSelectionCenter(). Definition at line 841 of file llmanipscale.cpp. References LLWorld::clipToVisibleRegions(), dist_vec(), f, FALSE, gAgent, LLSelectMgr::getBBoxOfSelection(), LLControlGroup::getBOOL(), LLManip::getMousePointOnPlaneAgent(), LLAgent::getPosAgentFromGlobal(), LLViewerObject::getPositionEdit(), LLViewerObject::getRotationEdit(), LLManip::getSubdivisionLevel(), getUniform(), gSavedSettings, gSelectMgr, gWorldp, LLViewerObject::isAttachment(), LLPrimitive::isAvatar(), LLXform::isRootEdit(), llclamp(), llmax(), llmin(), MAX_OBJECT_SCALE, LLViewerObject::mChildList, mDragFarHitGlobal, mDragPointGlobal, mDragStartCenterGlobal, mDragStartPointGlobal, MIN_OBJECT_SCALE, mInSnapRegime, mLastMouseX, mLastMouseY, mManipPart, LLManip::mObjectSelection, mScaleCenter, mScaleDir, mScalePlaneNormal1, mScalePlaneNormal2, mScaleSnapUnit1, mScaleSnapUnit2, mScaleSnapValue, mSnapGuideDir1, mSnapGuideDir2, mSnapRegimeOffset, LLManip::nearestPointOnLineFromMouse(), LLVector3::normVec(), partToMaxScale(), partToMinScale(), LLViewerObject::permModify(), LLViewerObject::permMove(), projected_vec(), LLManip::rebuild(), s, LLViewerObject::setPosition(), LLViewerObject::setPositionAbsoluteGlobal(), LLViewerObject::setScale(), LLVector3::setVec(), LLVector3d::setVec(), LLManip::sGridMaxSubdivisionLevel, LLManip::sGridMinSubdivisionLevel, t, TRUE, VX, VY, and VZ. Definition at line 1064 of file llmanipscale.cpp. References dist_vec(), FALSE, gAgent, LLSelectMgr::getBBoxOfSelection(), LLControlGroup::getBOOL(), LLManip::getMousePointOnPlaneAgent(), LLAgent::getPosAgentFromGlobal(), LLManip::getSubdivisionLevel(), getUniform(), gSavedSettings, gSelectMgr, llabs(), llclamp(), LLBBox::localToAgentBasis(), mDragPointGlobal, mDragStartCenterGlobal, mDragStartPointGlobal, mInSnapRegime, mLastMouseX, mLastMouseY, mManipPart, mScaleCenter, mScaleDir, mScalePlaneNormal1, mScaleSnapUnit1, mScaleSnapValue, mSnapRegimeOffset, LLVector3::mV, LLManip::nearestPointOnLineFromMouse(), partToMaxScale(), partToMinScale(), partToUnitVector(), projected_vec(), s, LLVector3::setVec(), LLVector3d::setVec(), LLManip::sGridMaxSubdivisionLevel, LLManip::sGridMinSubdivisionLevel, stretchFace(), t, TRUE, VX, VY, VZ, LLVector3::x_axis, LLVector3::y_axis, and LLVector3::z_axis. Definition at line 1933 of file llmanipscale.cpp. References F_SQRT2, LLManip::LL_EDGE_MAX, LLManip::LL_EDGE_MIN, llassert, S32, and v.
Referenced by partToUnitVector(), and renderEdges(). Definition at line 1867 of file llmanipscale.cpp. References f, LLManip::LL_FACE_MAX, LLManip::LL_FACE_MIN, LLManip::LL_FACE_NEGX, LLManip::LL_FACE_NEGY, LLManip::LL_FACE_NEGZ, LLManip::LL_FACE_POSX, LLManip::LL_FACE_POSY, LLManip::LL_FACE_POSZ, and llassert. Definition at line 118 of file llmanipscale.cpp. Definition at line 124 of file llmanipscale.cpp. Referenced by handleHover(), handleMouseUp(), and LLPanelObject::sendScale(). Definition at line 112 of file llmanipscale.cpp. Referenced by dragCorner(), dragFace(), renderGuidelinesPart(), renderSnapGuides(), stretchFace(), and updateSnapGuides(). Definition at line 169 of file llmanipscale.cpp. References LLManip::handleDeselect(), LLManip::LL_NO_PART, LLManip::mHighlightedPart, and mManipPart. Definition at line 407 of file llmanipscale.cpp. References LLSelectMgr::adjustTexturesByScale(), drag(), FALSE, getStretchTextures(), LLViewerWindow::getWindow(), gSelectMgr, gViewerWindow, LLTool::hasMouseCapture(), highlightManipulators(), lldebugst, llendl, mInSnapRegime, LLManip::mObjectSelection, LLWindow::setCursor(), LLTool::setMouseCapture(), TRUE, and UI_CURSOR_TOOLSCALE. Definition at line 320 of file llmanipscale.cpp. References FALSE, gViewerWindow, handleMouseDownOnPart(), LLViewerWindow::lastObjectHit(), LLManip::LL_NO_PART, and LLManip::mHighlightedPart. Definition at line 335 of file llmanipscale.cpp. References canAffectSelection(), LLSelectMgr::enableSilhouette(), f, FALSE, gAgent, LLSelectMgr::getBBoxOfSelection(), LLBBox::getCenterAgent(), LLAgent::getPosGlobalFromAgent(), gSelectMgr, highlightManipulators(), LLBBox::localToAgent(), mDragFarHitGlobal, mDragPointGlobal, mDragStartCenterGlobal, mDragStartPointGlobal, LLManip::mHelpTextTimer, LLManip::mHighlightedPart, mManipPart, partToUnitVector(), LLFrameTimer::reset(), S32, LLSelectMgr::saveSelectedObjectTransform(), SELECT_ACTION_TYPE_SCALE, LLTool::setMouseCapture(), LLManip::sNumTimesHelpTextShown, TRUE, unitVectorToLocalBBoxExtent(), and updateSnapGuides(). Definition at line 372 of file llmanipscale.cpp. References LLSelectMgr::adjustTexturesByScale(), LLSelectMgr::enableSilhouette(), FALSE, getStretchTextures(), gSelectMgr, handleHover(), LLManip::handleMouseUp(), LLTool::hasMouseCapture(), LLManip::LL_CORNER_MAX, LLManip::LL_CORNER_MIN, LLManip::LL_FACE_MAX, LLManip::LL_FACE_MIN, LLManip::LL_NO_PART, mLastUpdateFlags, mManipPart, S32, LLSelectMgr::saveSelectedObjectTransform(), SELECT_ACTION_TYPE_PICK, LLSelectMgr::sendMultipleUpdate(), sendUpdates(), and TRUE. Definition at line 160 of file llmanipscale.cpp. References LLSelectMgr::getBBoxOfSelection(), gFloaterTools, gSelectMgr, LLManip::handleSelect(), LLSelectMgr::saveSelectedObjectTransform(), SELECT_ACTION_TYPE_PICK, LLFloaterTools::setStatusText(), and updateSnapGuides(). Definition at line 436 of file llmanipscale.cpp. References canAffectSelection(), LLQuaternion::DEFAULT, f, gAgent, gCamera, LLCamera::getAspect(), LLAgent::getAvatarObject(), LLSelectMgr::getBBoxOfSelection(), LLBBox::getCenterLocal(), LLCriticalDamp::getInterpolant(), LLBBox::getMaxLocal(), LLBBox::getMinLocal(), LLViewerCamera::getModelview(), LLBBox::getPositionAgent(), LLViewerCamera::getProjection(), LLBBox::getRotation(), LLViewerWindow::getWindowHeight(), LLViewerWindow::getWindowWidth(), gSelectMgr, gViewerWindow, i, LLMatrix4::initAll(), LLMatrix4::initRotTrans(), lerp(), LLManip::LL_NO_PART, lldebugst, llendl, LLVector2::magVecSquared(), MANIPULATOR_IDS, MANIPULATOR_SCALE_HALF_LIFE, MAX_MANIP_SELECT_DISTANCE_SQUARED, LLManip::mHighlightedPart, LLVOAvatar::mHUDCurZoom, mManipulatorScales, mManipulatorVertices, LLManip::mObjectSelection, mProjectedManipulators, LLVector3::mV, NUM_MANIPULATORS, OGL_TO_CFR_ROTATION, S32, SCALE_MANIP_CORNER, SCALE_MANIP_FACE, SELECT_TYPE_HUD, SELECTED_MANIPULATOR_SCALE, LLVector2::setVec(), VW, VX, VY, VZ, and LLVector3::zero. Referenced by handleHover(), and handleMouseDownOnPart(). Definition at line 2006 of file llmanipscale.cpp. References i, S32, and v.
Definition at line 1959 of file llmanipscale.cpp. References LLVector3::abs(), i, LLVector3::mV, partToUnitVector(), unitVectorToLocalBBoxExtent(), VX, and VZ. Referenced by dragCorner(), dragFace(), and renderSnapGuides(). Definition at line 1983 of file llmanipscale.cpp. References LLVector3::abs(), i, MAX_OBJECT_SCALE, LLVector3::mV, partToUnitVector(), unitVectorToLocalBBoxExtent(), VX, and VZ. Referenced by dragCorner(), and dragFace(). Definition at line 1846 of file llmanipscale.cpp. References cornerToUnitVector(), edgeToUnitVector(), faceToUnitVector(), LLManip::LL_CORNER_MAX, LLManip::LL_CORNER_MIN, LLManip::LL_EDGE_MAX, LLManip::LL_EDGE_MIN, LLManip::LL_FACE_MAX, and LLManip::LL_FACE_MIN. Referenced by dragFace(), handleMouseDownOnPart(), partToMaxScale(), partToMinScale(), renderGuidelinesPart(), and updateSnapGuides(). Definition at line 210 of file llmanipscale.cpp. References canAffectSelection(), dist_vec(), f, gAgent, gCamera, LLQuaternion::getAngleAxis(), LLAgent::getAvatarObject(), LLSelectMgr::getBBoxOfSelection(), LLControlGroup::getBOOL(), LLAgent::getCameraPositionAgent(), LLBBox::getExtentLocal(), LLControlGroup::getF32(), LLAgent::getPosAgentFromGlobal(), LLBBox::getPositionAgent(), LLAgent::getPositionAgent(), LLBBox::getRotation(), LLSelectMgr::getSelectionCenterGlobal(), LLCamera::getView(), LLCamera::getViewHeightInPixels(), glPopMatrix, glRotatef, glTranslatef, gSavedSettings, gSelectMgr, LLManip::LL_NO_PART, mBoxHandleSize, LLVOAvatar::mHUDCurZoom, mManipPart, LLManip::mObjectSelection, LLVector3::mV, RAD_TO_DEG, range, renderCorners(), renderFaces(), renderGuidelinesPart(), renderSnapGuides(), LLManip::renderXYZ(), SELECT_TYPE_HUD, VX, VY, VZ, x, y, and z. Definition at line 779 of file llmanipscale.cpp. References end, gBox, getShowAxes(), glPopMatrix, glTranslatef, llabs(), mBoxHandleSize, LLVector3::mV, LLVector3::normVec(), LLBox::render(), renderBoxHandle(), start, VX, VY, and VZ. Definition at line 764 of file llmanipscale.cpp. References gBox, glPopMatrix, glTranslatef, mScaledBoxHandleSize, and LLBox::render(). Referenced by renderAxisHandle(), and renderCorners(). Definition at line 737 of file llmanipscale.cpp. References conditionalHighlight(), LLBBox::getMaxLocal(), LLBBox::getMinLocal(), i, j, LLManip::LL_CORNER_NNN, LLVector3::mV, renderBoxHandle(), S32, VX, VY, and VZ. Definition at line 712 of file llmanipscale.cpp. References conditionalHighlight(), edgeToUnitVector(), gBox, LLBBox::getExtentLocal(), glPopMatrix, glTranslatef, LLManip::LL_EDGE_MAX, LLManip::LL_EDGE_MIN, mBoxHandleSize, LLVector3::mV, LLBox::render(), unitVectorToLocalBBoxExtent(), VX, VY, and VZ. Definition at line 550 of file llmanipscale.cpp. References LLBBox::agentToLocalBasis(), conditionalHighlight(), f, face, gAgent, LLAgent::getCameraPositionAgent(), LLBBox::getCenterAgent(), LLBBox::getCenterLocal(), LLBBox::getMaxLocal(), LLBBox::getMinLocal(), glBegin, glColor4fv, glEnd, i, LLManip::LL_FACE_NEGX, LLManip::LL_FACE_NEGY, LLManip::LL_FACE_NEGZ, LLManip::LL_FACE_POSX, LLManip::LL_FACE_POSY, LLManip::LL_FACE_POSZ, LLManip::LL_NO_PART, mManipPart, LLManip::mObjectSelection, LLVector3::mV, LLColor4::mV, renderAxisHandle(), S32, VX, VY, and VZ. Definition at line 1332 of file llmanipscale.cpp. References f, LLBBox::getCenterLocal(), getUniform(), gl_stippled_line_3d(), gWorldPointer, mManipPart, LLVector3::normVec(), partToUnitVector(), and unitVectorToLocalBBoxExtent(). Definition at line 1519 of file llmanipscale.cpp. References clamp_rescale(), f, gAgent, gCamera, LLCoordFrame::getAtAxis(), LLControlGroup::getBOOL(), LLBBox::getCenterAgent(), LLFrameTimer::getElapsedTimeF32(), LLControlGroup::getF32(), LLSelectMgr::getGridMode(), LLCoordFrame::getLeftAxis(), LLAgent::getPosAgentFromGlobal(), LLSelectMgr::getSavedBBoxOfSelection(), LLManip::getSubdivisionLevel(), getUniform(), LLCoordFrame::getUpAxis(), glBegin, glColor4f, glColor4fv, glEnd, GRID_MODE_WORLD, gSavedSettings, gSelectMgr, hud_render_utf8text(), i, is_approx_equal(), llabs(), llceil(), llclamp(), llmax(), llmin(), llround(), lltrunc(), mBoxHandleSize, mDragPointGlobal, LLManip::mHelpTextTimer, mInSnapRegime, mManipPart, LLManip::mObjectSelection, mScaleCenter, mScaleDir, mScaleSnapUnit1, mScaleSnapUnit2, mScaleSnapValue, mSnapGuideDir1, mSnapGuideDir2, mSnapGuideLength, mSnapRegimeOffset, LLColor4::mV, LLVector3::mV, LLFontGL::NORMAL, LLVector2::normVec(), LLVector3::normVec(), partToMaxScale(), LLManip::renderTickValue(), S32, SELECT_TYPE_HUD, LLManip::setupSnapGuideRenderPass(), LLManip::sGridMaxSubdivisionLevel, LLManip::sGridMinSubdivisionLevel, LLManip::sHelpTextFadeTime, LLManip::sHelpTextVisibleTime, LLManip::sMaxTimesShowHelpText, LLManip::sNumTimesHelpTextShown, LLFontGL::sSansSerif, LLManip::sTickLabelSpacing, LLManip::updateGridSettings(), VALPHA, VBLUE, VGREEN, VRED, and LLColor4::white. Definition at line 1205 of file llmanipscale.cpp. References dialog_refresh_all(), FALSE, LLControlGroup::getBOOL(), LLTimer::getElapsedTimeF32(), gSavedSettings, gSelectMgr, mLastUpdateFlags, mSendUpdateOnMouseUp, LLTimer::reset(), LLSelectMgr::sendMultipleUpdate(), TRUE, UPD_NONE, UPD_POSITION, UPD_SCALE, and UPD_UNIFORM. Definition at line 100 of file llmanipscale.cpp. Definition at line 106 of file llmanipscale.cpp. Definition at line 94 of file llmanipscale.cpp. Definition at line 1243 of file llmanipscale.cpp. References LLBBox::agentToLocal(), LLWorld::clipToVisibleRegions(), f, FALSE, gAgent, LLViewerObject::getBoundingBoxAgent(), LLAgent::getPosAgentFromGlobal(), LLViewerObject::getPositionEdit(), LLViewerObject::getRotationEdit(), LLXform::getScale(), getUniform(), LLXform::getWorldRotation(), gWorldp, is_approx_zero(), LLViewerObject::isAttachment(), LLPrimitive::isAvatar(), LLXform::isRootEdit(), llclamp(), LLVector3::magVec(), MAX_OBJECT_SCALE, LLViewerObject::mChildList, mDragStartCenterGlobal, LLViewerObject::mDrawable, MIN_OBJECT_SCALE, LLManip::mObjectSelection, LLVector3::mV, nearestAxis(), LLViewerObject::permModify(), LLViewerObject::permMove(), LLManip::rebuild(), S32, LLViewerObject::setPosition(), LLViewerObject::setPositionGlobal(), LLViewerObject::setScale(), and LLVector3::setVec(). Definition at line 1946 of file llmanipscale.cpp. References LLBBox::getCenterLocal(), LLBBox::getMaxLocal(), LLBBox::getMinLocal(), LLVector3::mV, and v.
Referenced by handleMouseDownOnPart(), partToMaxScale(), partToMinScale(), renderEdges(), renderGuidelinesPart(), and updateSnapGuides(). Definition at line 1358 of file llmanipscale.cpp. References LLVector3::abs(), dist_vec(), f, gAgent, gCamera, LLCoordFrame::getAtAxis(), LLAgent::getAvatarObject(), LLBBox::getCenterAgent(), LLSelectMgr::getGrid(), LLBBox::getMaxLocal(), LLCoordFrame::getOrigin(), LLViewerCamera::getPixelMeterRatio(), LLBBox::getRotation(), getUniform(), LLCoordFrame::getUpAxis(), LLViewerWindow::getWindowWidth(), gSelectMgr, gViewerWindow, LLManip::LL_CORNER_MAX, LLManip::LL_CORNER_MIN, LLManip::LL_CORNER_NNN, LLManip::LL_CORNER_NNP, LLManip::LL_CORNER_NPN, LLManip::LL_CORNER_NPP, LLManip::LL_CORNER_PNN, LLManip::LL_CORNER_PNP, LLManip::LL_CORNER_PPN, LLManip::LL_CORNER_PPP, LLManip::LL_FACE_MAX, LLManip::LL_FACE_MIN, llabs(), llmax(), llmin(), LLBBox::localToAgent(), LLVector3::magVec(), LLVOAvatar::mHUDCurZoom, mManipPart, LLManip::mObjectSelection, mScaleCenter, mScaleDir, mScalePlaneNormal1, mScalePlaneNormal2, mScaleSnapUnit1, mScaleSnapUnit2, mSnapDir1, mSnapDir2, mSnapGuideDir1, mSnapGuideDir2, mSnapGuideLength, mSnapRegimeOffset, LLVector3::mV, LLVector3::normVec(), partToUnitVector(), projected_vec(), LLVector3::rotVec(), S32, LLVector3::scaleVec(), SELECT_TYPE_HUD, LLVector3::setVec(), SNAP_GUIDE_SCREEN_LENGTH, SNAP_GUIDE_SCREEN_OFFSET, unitVectorToLocalBBoxExtent(), VX, VY, VZ, LLVector3::x_axis, LLVector3::y_axis, and LLVector3::z_axis. Referenced by handleMouseDownOnPart(), and handleSelect(). Definition at line 127 of file llmanipscale.h. Referenced by conditionalHighlight(), render(), renderAxisHandle(), renderEdges(), and renderSnapGuides(). Definition at line 133 of file llmanipscale.h. Referenced by dragCorner(), and handleMouseDownOnPart(). Definition at line 132 of file llmanipscale.h. Referenced by dragCorner(), dragFace(), handleMouseDownOnPart(), and renderSnapGuides(). Definition at line 131 of file llmanipscale.h. Referenced by dragCorner(), dragFace(), handleMouseDownOnPart(), and stretchFace(). Definition at line 130 of file llmanipscale.h. Referenced by dragCorner(), dragFace(), and handleMouseDownOnPart(). Definition at line 153 of file llmanipscale.h. Referenced by dragCorner(), dragFace(), handleHover(), and renderSnapGuides(). Definition at line 134 of file llmanipscale.h. Definition at line 135 of file llmanipscale.h. Definition at line 137 of file llmanipscale.h. Referenced by handleMouseUp(), and sendUpdates(). Definition at line 129 of file llmanipscale.h. Referenced by conditionalHighlight(), drag(), dragCorner(), dragFace(), handleDeselect(), handleMouseDownOnPart(), handleMouseUp(), render(), renderFaces(), renderGuidelinesPart(), renderSnapGuides(), and updateSnapGuides(). Definition at line 154 of file llmanipscale.h. Referenced by conditionalHighlight(), highlightManipulators(), LLManipScale(), and ~LLManipScale(). Definition at line 139 of file llmanipscale.h. Definition at line 138 of file llmanipscale.h. Referenced by highlightManipulators(), and LLManipScale(). Definition at line 150 of file llmanipscale.h. Referenced by dragCorner(), dragFace(), renderSnapGuides(), and updateSnapGuides(). Definition at line 128 of file llmanipscale.h. Referenced by conditionalHighlight(), and renderBoxHandle(). Definition at line 151 of file llmanipscale.h. Definition at line 142 of file llmanipscale.h. Referenced by dragCorner(), dragFace(), and updateSnapGuides(). Definition at line 143 of file llmanipscale.h. Referenced by dragCorner(), and updateSnapGuides(). Definition at line 140 of file llmanipscale.h. Definition at line 141 of file llmanipscale.h. Referenced by dragCorner(), renderSnapGuides(), and updateSnapGuides(). Definition at line 152 of file llmanipscale.h. Definition at line 136 of file llmanipscale.h. Definition at line 146 of file llmanipscale.h. Definition at line 147 of file llmanipscale.h. Definition at line 144 of file llmanipscale.h. Definition at line 145 of file llmanipscale.h. Definition at line 149 of file llmanipscale.h. Referenced by renderSnapGuides(), and updateSnapGuides(). Definition at line 148 of file llmanipscale.h.